It's a long, long way from Toronto's Don Valley Parkway to the royal court of Shah Tahmasp I, who ruled Persia in the 16th century, but all of a sudden closer than you'd think. On Sept. 18, the Aga Khan Museum, a chiseled, light-filled structure of Brazilian granite, opened its doors to the public and, with a primary goal of raising awareness about Muslim culture. The project is funded by Prince Karim Aga Khan IV, the religious leader of the Shia Ismaili Muslim community, and his organization, the Aga Khan Development Network. The museum is the first of its kind, displaying artifacts from Islamic civilizations over the centuries. As the first museum of Islamic art in all of North America, it acts as a pioneer of pluralism and tolerance. Muslim societies comprise a quarter of the world’s population, yet there is limited knowledge of the people and their faith in the West. This considerable lack of understanding spans all aspects of the peoples of Islam: their pluralism, the diversity of their interpretations of the Qur’anic faith, the chronological and geographical extent of their history and culture, as well as their ethnic, linguistic and social diversity. 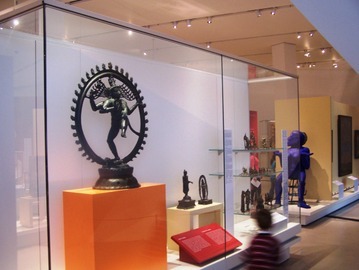 Artifacts are displayed on two floors, in large, high-ceilinged, discreetly lit white rooms with teak floors. The main-floor space prefaced by a corridor illuminated by an arresting series of video animations, has its treasures arranged chronologically on an L-shaped footprint, and is decidedly Catholic in its presentation. There are three large vitrines displaying Korans of varying degrees of calligraphic magnificence; a 10th-century inkwell carved from rock crystal; a marble fountain, with geometric mosaics, from a palatial courtyard in 15th-century Egypt; a tunic of beige brocaded silk worn by a horseman in 14th-century Iran; the oldest-known extant version of The Canon of Medicine, compiled in Persia in the 11th century; a bronze astrolabe with silver insets from 14th-century Spain, its surface inscribed in Arabic, Hebrew and Latin. Not only are the artificats on display stunning - the setting is as well. The structure features a spectacular dome-shaped auditorium, two permanent galleries, a rotating gallery, an Ismaili religious centre, an indoor courtyard and an outdoor courtyard that mimics the Mughal-made Shalimar Gardens in Lahore. For fine diners, the museum’s Diwan restaurant offers tastes of Turkey, Iran, North Africa, Central and South Asia. For those in search of merchandise, the building has a gift shop that features items inspired by the museum’s collection of nearly 1,000 artifacts. We all enjoyed out visit to the museum and will be eturning for future exhibits and of course to eat again at Diwan! We had four meals in Great Barrington - two at restaurants and two at home in the rental house. Paul took it upon himself to do the research for the second restaurant (the first being the Route 7 Grill). He e-mailed the owner of the rental and asked her for some recommendations - he let her know that we were looking for something local that adhered to a farm-to-table philosophy. One of the finalists was Allium - located about 10 minutes from our house. We considered walking there but thank goodness we didn't because the rain was teeming down when we finished our dinner! serving contemporary American cuisine with a varying seasonal menu focusing on local, farm-fresh ingredients. We support independent local farmers and artisan producers to ensure quality ingredients and a stronger community. Situated in the center of Great Barrington’s bustling downtown, Allium features an exceptional, well-chosen wine list to accompany seasonal dinner offerings and offers an extensive selection of cocktails in our popular, late-night bar. Selected as Editor’s Choice in Yankee Magazine’s Travel Guide to New England, Allium has also been awarded Boston Magazine’s Best New Restaurant. It sounded right up our alley! The menu was interesting - really featuring something for everyone with an interesting Asian influence. We each ordered an appetizer, main, and Paul and I ordered dessert. I went simple - a salad. Paul selected the Korean tacos with pork bulgogi, kimchi, sriracha, finished with garlic cilantro aioli. I knew right away that mom would order the buratta. It was served with toasted baguette from the Berkshire Mountain Bakery, smoked lardo, almonds, pickled vegetables, and apricot mustard. All three were great - yes, even my simple salad made with local greens. Four our mains we went 'all over the place' so to speak. I selected the orecchiette which was served with a beef/veal/pork bolognese sauce. Paul ordered the roast pork loin and mom the chicken. 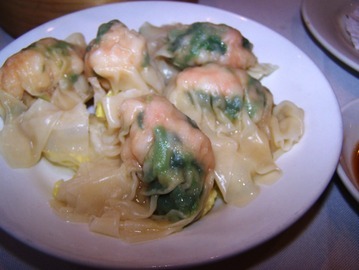 All three were excellent - large portions of flavourful, well-prepared food. We were pretty full by this point but I wanted to try dessert. One of the features was a pear cake served with roasted plums. Hello - a wonderful fall dessert if I had ever heard of one! Each item on the menu at Allium comes with a pedigree because the ingredients are sourced with pride from the fields and farms of Berkshire county. On a warm day, you can check out the Great Barrington street life through the open garage-door-style window at the front of the space. The bar is open late, so stop in for a nightcap. The wine list is varied, leaning towards Italian varietals,a nd the pours generous. If you are in Great Barrington and looking for a nice dinner out you would not go wrong here! Normally when we're heading along the I-90 through upstate New York we like to pop into Dinosaur BBQ for a great meal but our timing on our recent trek was off - we'd either arrive to early for lunch or too late so that we'd be famished. While doing a bit of research online I found that there was a BBQ joint in Great Barrington. I made reservations there for Friday night figuring we'd be too tired to cook. 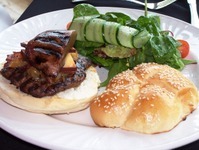 We at Route 7 Grill are proud to be providing fresh, local food to our Berkshire neighbors and friends. 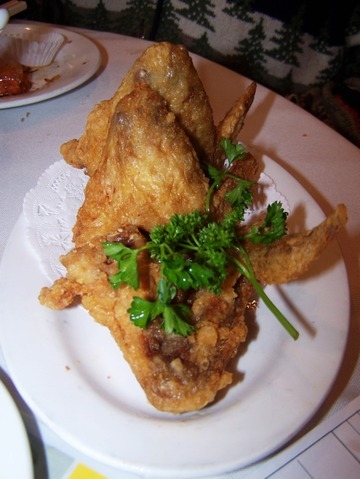 All of our meats are naturally raised from local farms or small family farms. Perfect - BBQ AND farm-to-table. Once the reservations were made though I found some troubling reviews on Yelp. Troubling to the point that I was tempted to cancel my reservations. There was one thing that held me back - even the bad reservations spoke of a busy or full restaurant. If things were really that bad there was no way the place would be consistently that full. I'm glad that I ignored my reservations (pun intended). We had a great meal at Route 7 Grill. The fall menu had just started so the ingredients were 'fall-like' - kale, greens, squash, etc. We started with an appetizer order of the famous smoked-chicken wings and the kale chips with chipotle dip. They were both great (although mom was hesitant to try kale chips she did). I'm not sure if I have ever had smoked wings prior to this and I thought that they'd put Buffalo out of business if they caught on! For my main course I ordered a half rack of ribs. 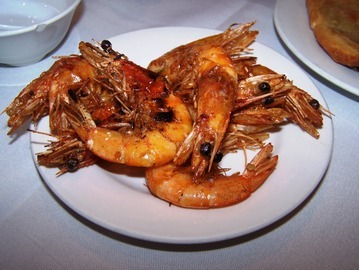 They came delicately smoke with a delicious house-made sauce. This was all washed down with their feature drink - a 'fall' lemonade made with freshly squeezed lemons and locally distilled bourbon. YUM. There are lots of great restaurant choices in Great Barrington - don't be put off by those Yelp reviews (I had to join Yelp to post my OWN review in response to those haters). 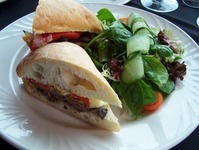 Route 7 Grill is a great restaurant adhering to the slow food movement. The ingredients are locally sourced wherever possible from farms with natural traditions. . . I liked knowing the greens I was eating came from Equinox Farm and not a bag labelled 'Dole' or 'Andy Boy'. As you drive along Route 7 just south of Great Barrington look for the Holstein on the east side of the road, pop in and be impressed. When I knew I was heading to Colorado one of the first thing I did was check to see if there was an In-N-Out nearby. We ALWAYS have In-N-Out when we're in California and I figured that Colorado was close. Not close enough apparently. *sigh* My colleague was disappointed, she has heard me blather on about In-N-out burger for some time - she was hoping to make a trip to burger heaven. . .
Last Thursday my colleague said she felt like a good burger for dinner. Always oneto go along with a huge pile of grilled beef I quickly googled 'Denver's best burger' and was directed to a quickly growing local chain called Smashburger. I crossed my fingers and discovered that there was one close to the hotel. MMMMM We headed out, hopeful that we would find something close to the joy that is In-N-Out! We found thick, hand-mixed shakes, made with Häagen-Daz ice cream and served with the can, and big old root beer floats fizzing with robust IBC root beer. The crisp, golden fries come sprinkle of sea salt or tossed with fresh rosemary, garlic, and olive oil. Joanne still talks about the onion strings! There’s even a small and inexpensive beer and wine selection. The restaurant’s name refers to its practice of pressing down on the burgers while they’re on the grill. That seems counter intuitive, smashing the meat’s juices out of the patty, but the results, in third- and half-pound options, are perfectly charred on the outside and pleasantly juicy inside. They’re nicely topped, too, with add-ons that include thick slices of applewood-smoked bacon, fried eggs, deep-fried onions and sautéed mushrooms; even the toasted buns earn bonus points for quality control. Heck - they won't even mock you if you have it plain! I however, make no such promises. The brightly colored, super-graphic setting has its perks, the staff is cheerleader-level friendly and $6.99 is the menu’s price ceiling. Apparently this is a chain on the move, in fact they have recently signed a mega deal to move into the midwest . . . come on Smashburger - Toronto isn't that far away! Oh yes, how did it compare to the fabled In-N-Out burger? Shhhhh . . . it may have been better (as he looks about for bolts from above coming to strike him down)! When it comes to food I confess to being a tad schizophrenic. While I enjoy cooking, and love fine dining, I am also happy as a clam when I zip the car into a fast food drive through and order a meal with a month's worth of fat and sodium in it. When we're traveling we often make a point of popping into a fast food joint to try a 'delicacy' that we are unable to get at home. When in California we try and hit In-N-Out Burger (sadly, they are only located in California, Nevada, Utah, and Arizona). In-N-Out Burger is the best fast food restaurant in my opinion. I’m not even sure if you can classify them as fast food. Each burger is freshly made to order and tastes amazing. We made sure to add a stop at In-N-Out to our trip from San Francisco to Paso Robles last week. It was as amazing as the other times I've been lucky enough to be driving past one of the yellow, red, and white buildings and my car, controlled by unquenchable cravings for fine fast food, just happened to pull in. The buns are are baked daily from natural yeast-fed dough. In fact, little about In-N-Out's food preparation has changed since Harry and Esther Snyder opened their first drive-through in 1948. Produce, including large, vine-ripe tomatoes, is delivered fresh every other day, then washed and cut by hand. The Snyder family, still running the show, has never allowed freezers, heat lamps, or microwaves, so every sandwich is truly made-to-order and served hot. Few things compare to good simple eats. You can get all crazy and order a panini sandwich and espresso across the street, but if you just want a tasty meal on easy street then go to In-N-Out Burger. The menu is simple - no gimmicks nor attempts at health conscious food here. There is a secret menu but I'm saving that for a future post . . . They do two thing - burgers and fries - and do them well. (well, they are also known for their milkshakes but never having ordered one, I really can't comment on them) The burgers are freshly made, never frozen, without any additives of any sort. The fries are cut right in the store, one potato at a time - again . . . not frozen. They are cooked in 100% pure, cholesterol-free vegetable oil (because I really care about cholesterol free fries when I am knocking back a large order of 'em!). The burger is everything that fast food should aspire to be: the fresh, never-frozen beef; crisp, fresh produce; well built. The bun was toasted perfectly -- a nice contrast of crunch and softness in and of itself. Easily the best burger from a fast food chain I've ever had! There is a reason In-N-Out Burger is always busy. It's good! Its cheap! And its simple. I mean the menu is how you like your burger and if you want fries and a drink. That's it. End of story. Of yes, did you know that Thomas Keller - considered to be one of American's greatest chefs, LOVES In-N-Out Burger? If the genius behind Northern California's only Michelin three-star restaurant, The French Laundry, is a fan then this is fast food that must be good! I really respect a company that holds its ground when there is so much pressure to follow the "what’s next, what’s new" trend. In-N-Out’s quality lies in the simplicity of what it promises and delivers. To be able to do something over and over with integrity and excellence, even if it is fast food, is something to be truly admired. There you have it. This is serious fast food. If you happen to be in the area pop in and have an 'experience'! One of the nice thing about the slowtravel community is the phenomenon known as the GTG (get together). This is when a group of slowtravelers, often instigated by someone from visiting the area, suggest a dinner out or some other form of social fun. People from the area (or who are also visiting) jump on the bandwagon and soon a party of sorts is being planned. GTGs can be fancy like Palma's famous Desert GTG, or casual and relaxed, like the GTG we enjoyed with Ron and Wendy in Carmel last March. We have enjoyed GTGs in Rome, Venice, Montespertoli, Chianti, Carmel, Paso Robles, Pasadena, Palm Desert, and San Francisco. I suspect that Paul believed GTGs all happened somewhere else. Last night I proved him wrong when we enjoyed a GTG in Toronto. We started off by heading to the ROM. Marion is a member and was able to bring three guests in with her at no charge. We are always up for a visit to the museum so we jumped at the offer. The idea was to experience the beauty and diversity of the South Asian sub-continent. The newly opened Sir Christopher Ondaatje South Asian Gallery contains over 5,000 years of history which is revealed through a beautiful collection of religious objects and sculpture, decorative arts, arms and armour, miniature paintings and textiles. We all thought that the new exhibit needs some work; there is no flow and the displays seemed incomplete. Hopefully this is just one step on a larger transition. After we had had enough of March Break at the ROM (think lots of children) Marion suggested heading up to the new restaurant at the ROM c5 (on the fifth floor of the crystal, hence c5) for a pre-dinner drink. Who were we to refuse? 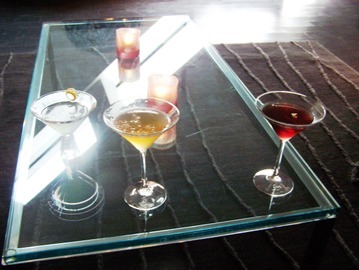 The lounge at c5 is a chic location in the city to unwind. Soft leather lounge seating and original glass art installations set the mood, while the superb wine list, great bar menu and signature ROMtini make it the ideal destination for intimate social gatherings and private parties. We order our martinis. Paul a Purple Haze made with Ketel One Vodka, Crème de Cassis, Citrus. Marion ordered the winner of the ROM Martini contest - the ROMtini which is mixed from Grey Goose Vodka, Hypnotique, Splash of Scotch. I decided upon the Maple Leaf which is made from Crown Royal Canadian Whiskey, Maple Syrup, Lemon. Our drinks were wonderful; it was such a civilized way to start our evening, wonderful people, a beautiful setting, well-made drinks and the late winter sun pouring in from outside. We thought that we might need to order some nibblies to go with our drinks; it just would NOT do to show up tipsy at the restaurant! Marion suggested the Charcuterie Plate which was an assortment of Niagara cured meats, olives, froie gras, smoked lake Ontario trout, sweet cured straw mushrooms, and a pear gelee with brioche. 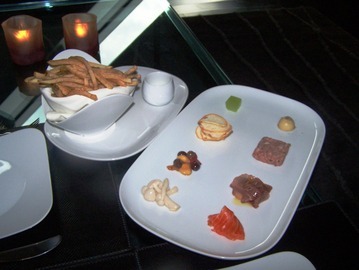 She also suggested the frites which were served an Espellete Aioli. WOW this was an incredible start to an evening which promised more good food. After enjoying our drinks and snacks, we grabbed a cab to the restaurant where we were meeting Marg, Doru, and his wife Josette - Tutti Matti. This is one of our favourite restaurants in the city. The chef serves traditional Tuscan cuisine which is made by using only fresh seasonal ingredients. Everything is made in house, including the fresh breads and pastas. They carefully preserve the simple, hearty, robust flavours for which Tuscan food is known. We were seated at the front of the restaurant away from some large parties at the back, however it was still challenging to hear one another. Marg had brought a very beautiful self-published photo album, "Roma e Napoli", over 190 pages of photos with captions from her recent trip to Rome and Naples. She had had it published through Blurb. I was amazed at the quality of her photos and the book itself. The food was excellent as always. Our waiter was from near Sant' Andrea della Valle area in Rome and he was shocked to learn from Doru that his favourite childhood bakery had been remade into an Internet cafe. Apparently even eternal Rome is not protected from the fast pace of change. 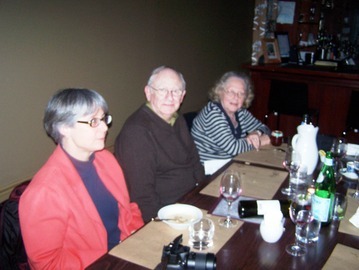 The food was excellent and after dinner a photo shoot-out took place between Marg, Marion and myself. 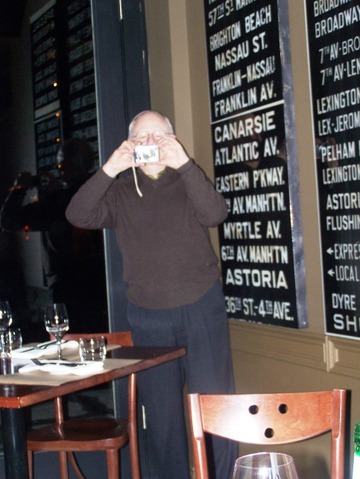 I have to say though that viewing Marg's photos has just reinforced for me that I need a new camera! I think I will order it tomorrow. 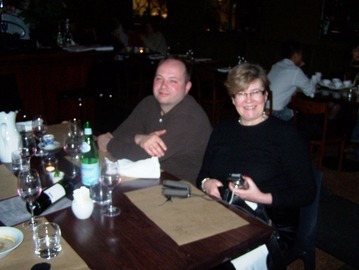 It was a wonderful evening - thank you Marg for initiating it! 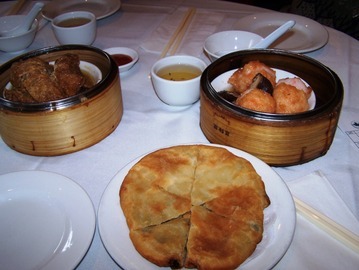 Yesterday we had our hearts set on a Dim Sum feast after visiting the ROM. Paul insisted that we go to a dim sum restaurant where they wheel the food around the restaurant on a cart (as compared to the restaurants where you actually place an order). It makes for a fun experience. You signal to the server that you are interested in somethng on the cart. She places it on your table and marks off your bill. often you don't have a clue what you're getting . . . this becomes the adventure! 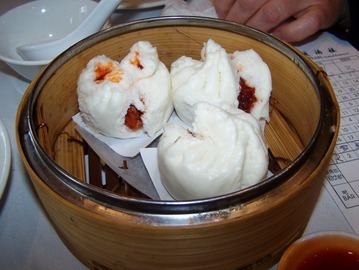 I suggested that we go the Bright Pearl, a Toronto chinatown landmark. Alongside Kensington Market, this majestic eatery contains its own fish tank. 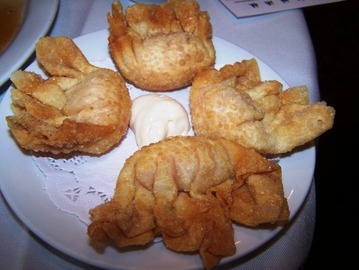 Filled with live lobster, Vancouver crab, and bass, it reflects the fresh seafood offered here. 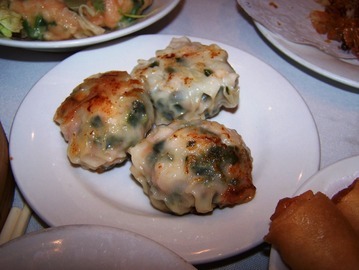 The dim sum is another all-day staple, although early morning and mid-afternoon happy hours offer freshly steamed shrimp or pork, beef balls or ribs, steamed BBQ pork chicken or sticky rice and spring rolls. After being seated in the expansive dining room, we listened to the chatter of happy customers and the clicking of china and chopsticks. Once our cups were filled with soothing jasmine tea the fun began. 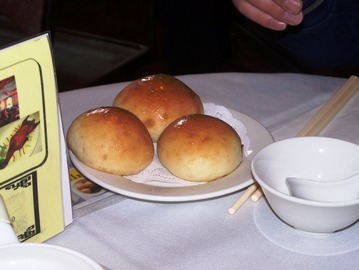 Luckily there was a visual dim sum pamphlet at our table, which helped us identify some of the selections. When the time came to leave we paid the bill ($ 73) and rolled ourselves out to the car. We were stuffed but happy! a shameless self-promotion . . .
Our photo is currently number 16 out of 464 photos. She got her start in Montreal in the '80s, making fruit-laden crepes, shakes and French toast recipes and hasn't looked back since. Cora Mussely Tsouflidou, a hard-working single mom saw her restaurant dream to fruition in La Belle Province, opening a chain of successful restaurants and breakfast has never been the same. Cora's came to Ontario a few years ago and for that we say, merci . I can remember our friends Ruth and Catherine talking about special trips just to have breakfast. This is unheard of! They even declared that were they to wine a lottery the first purchase would be a Cora's franchise! Usually packed, the restaurants have a country kitchen feel. 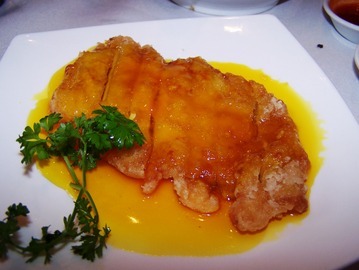 Expect warm, yellow-painted walls with specialty dishes etched on the walls. Service is cheerful, though depending on how busy the place is, can be slow. Whenever I have been to the ones in the Toronto area the line-up has been to the door. The menu is huge with a wide array of breakfast items, making it hard to narrow down to just one choice. Recently seen on the menu: Cora's Special (eggs, bacon, ham, sausage and crepe) $8.45, Eggs Ben et Dictine (two poached eggs, English muffin, with hollandaise, potatoes and fresh fruit) $10.45-$11.35, Crepes $7.95-$9.45, Rosemary's Sunday $8.25, Surprise (egg, ham and Swiss cheese sandwich with fruit) $8.35. Menu selections change regularly depending on the season and each dish has its own tale to tell. Earlier this week when I was in Ottawa I discovered that there was a Coras near the hotel in which I crached for the night. I found my way there at 6:30 am (ready to beat the morning rush) and had a wonderful breakfast. 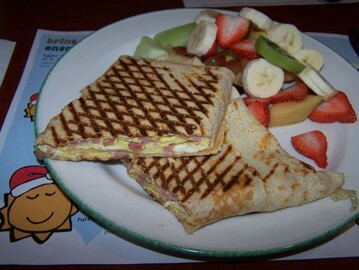 I decided upon the special of the month which was a breakfast paninni stuffed with a ham and cheese. The paninni was grilled and served piping hot. On the side was a huge serving of fresh fruit. This truly was an incredible way to start off the day. Our photo is currently number 15 out of 464 photos. One of the most challenging aspects of our theatre evenings out is where to go for dinner pre-theatre (live is difficult isn't it? *smile*) We have to balance 6 different tastes, budgets, and varying degrees of food snobbery (OK, I'll admit that I am the food snob). Ruth suggested going to a restaurant close to the theatre that we had not tried - Urban. Among a string of restaurants in the Theatre District along King West, sits this metropolitan diner. The Executive Chef Michael Harbour oversees all work in the kitchen, providing an eclectic collection of dishes. With a Mediterranean theme, the restaurant features pasta, pizza, omelettes and seafood for lunch. 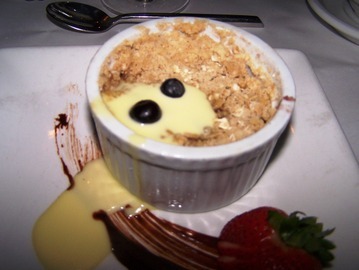 The dinner menu includes cashew-crusted halibut, pan-roasted Muscovy duck breast, and Australian Big Eye lamb chops. The casual, contemporary diner adds the touch of comfort for colder evenings with a wood-burning fireplace. The restaurant was featuring a three course prix fixe menu for $ 35. Most of us elected to give that a whirl. 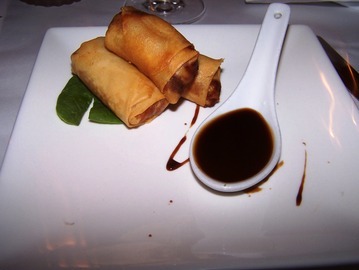 I started with the duck spring rolls. 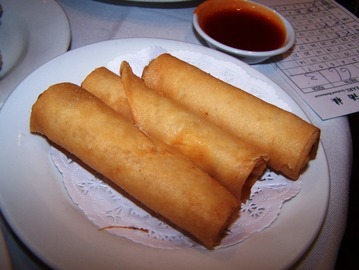 The order came with three crispy spring rolls stuffed with duck confute. 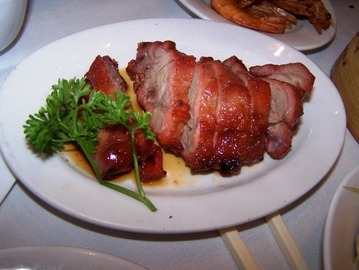 The hoisin sauce was laced with freshly squeezed lime juice which provided a nice counterpoint to the duck. The flavors in this starter came together quite nicely. For my main course I decided to try their take on Osso Buco. 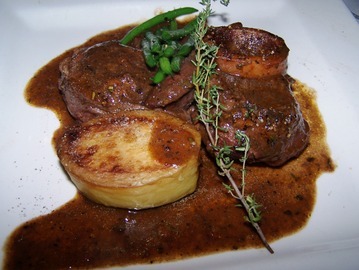 The traditional veal shanks were braised and then slowly cooked in a red wine tomato based sauce. They were served with with fondant potato and sauteed french green beans. This was a good dish but not a great one. Both Paul and I agreed that the recipe that Jane shared with us and we made in the spring was far tastier! All in all it was a great meal. The food was good, prices reasonable, and the wine list passable. The only drawback was the service. While it started off well it went downhill. Now in fairness, this seems to be a pattern for the Toronto theatre district. For some reason whenever we go out to dinner prior to a show the waiter is reluctant to bring the damn bill when we want it. In my mind it is inexcusable to take 45 minutes to bring the bill - when people ask you for it bring the flipping thing! Last week I posted about the day in Niagara wine country that I enjoyed with my sister who was visiting from Cape Breton in Nova Scotia. I mentioned that we stopped for a nice lunch but haven't said anything more since then. Today is review time. We both decided upon sandwiches. Rose enjoyed the VIEW burger which is described as Wine country’s premier burger, homemade with Ontario ground beef topped with melted Swiss cheese and mushrooms sautéed in Chardonnay. She agreed that it was incredible. My choice was the Cabernet Beef Tip Sandwich. It was made with Cabernet marinated Beef Tips which were topped with marinated red peppers, caramelized onions and “cream du village” cheese. Both our sandwiches came with a great salad. We both decided to throw caution to the wind and order dessert. 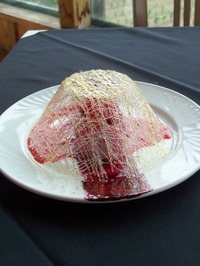 Rose odered a raspberry mousse cake which was served under a 'bowl' of spun sugar. 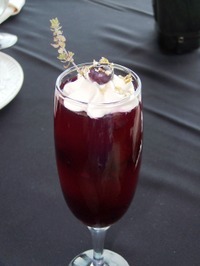 I ordered a blueberry gelatin which was studded with lemon zest, blueberries, and flavoured with subtle hints of lemon thyme. It was topped with whipping cream and gold flake. YUM!